A singer of immense stature graces the Alchemy Festival at Southbank Centre in London on Sunday for the first time and we ask what is it that excites people about this Sufi songstress? 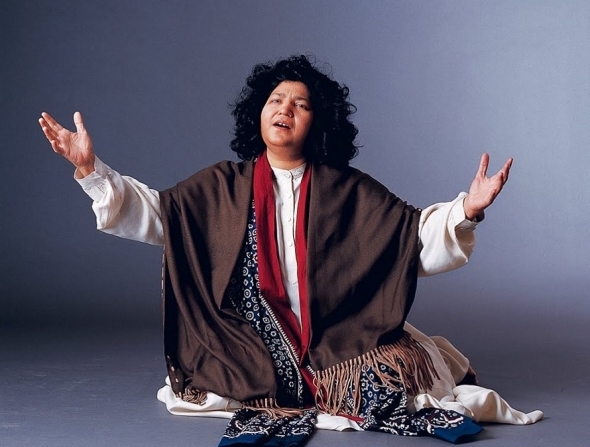 ONE OF THE UNDOUBTED highlights at this year ‘s Alchemy Festival is the singer, Abida Parveen, Queen of Sufi music who will be performing at the Royal Festival Hall on Sunday (May 28). Presented as part of the Rafi Peer Mystic Music Sufi Festival, this is the first time Parveen will be attending Alchemy to perform in a spiritual concert just as Ramadan has got underway (fasting starts tomorrow). Rafi Peer was a noted playwright from Pakistan whose children set up an organisation in his name to promote arts and culture from Pakistan. There is palpable excitement amongst the South Asian classical concert going community as Parveen is one of the world greatest singers whose ability to sing, Sufi Kalam (poetry) of people like Bulleh Shah and Khwaja Ghulam Farid is peerless. She is known for singing “Kafis” – a solo genre accompanied by percussion and harmonium, using a repertoire of songs by Sufi poets. She sings in Urdu, Sindhi, Saraiki, Punjabi and Persian. However she is a versatile performer and can also sing ghazals. Music producer, Jay Visvadeva who’s currently presenting Women in Music festival under his Sama Arts Network banner, explains how Parveen shattered the glass ceiling as far as performing Sufi music is concerned. Parveen was trained initially by her father, Ustad Ghulam Haider, who eschewed his male children to pass the mantle of singing to his daughter. “Some people go crazy over her singing style, and she has an incredible stage presence, but off stage she is shy and introverted,” he said. Visvadeva, who has produced ten of her UK tours, asserted that: “Parveen is totally lost in her Sufi music tradition, and this gives her maximum upliftment. Parveen 63, hails from Larkhana, Sind (also Benazir Bhutto’s homeland), and has been singing since she was three years old. She attended her father’s music school in her early years, and was later taught and nurtured by Ustad Salamat Ali Khan of the Sham Chorasia Gharana (school of music). As a performer, she began by singing live at the shrines – and on the death anniversary festivals of Sufi saints called Urs. Later, she was introduced as an official singer for Radio Pakistan and her career began to develop. She married Ghulam Hussain Sheikh, a producer from Radio Pakistan who became her manager. They had three children and he died of a heart attack while travelling on an international flight back to Pakistan. During the 1990s she began to travel globally and Visvadeva believes she first played in the UK in 1988. Her sound has influenced musicians from across all genres. The artist, Bjork considers herself a fan, and used Perveen’s voice on a DJ set she made for Triangle Records birthday anniversary in 2015 (an independent record company from New York). The late, Sir John Tavener, the English composer known for his religious works invited Perveen to be a special guest on a piece he wrote for the 2013 Manchester International Festival’s Sacred Sounds Women’s Choir. With a career spanning over four decades, Parveen is best known for her songs, ‘Yaar ko Hum Ja Baja Dekha ‘ (When I Saw My Beloved..) from the album, Raqs-e-Bismil, and ‘Tere Ishq Nachaya’ (Your Love Has Made Me Dance), a rendition of Bulleh Shah’s poetry. The poet and producer, Mahmood Jamal – who produced a concert with Parveen considered to be her first televised concert in the UK – summed up her enormous appeal.